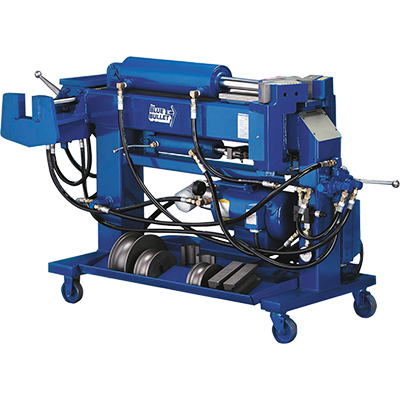 Pipe benders are our longest-running legacy here at BendPak, and since they're the inspiration for the first half of our name (“Bend”), we take particular pride in each bender we design, manufacture and roll out. 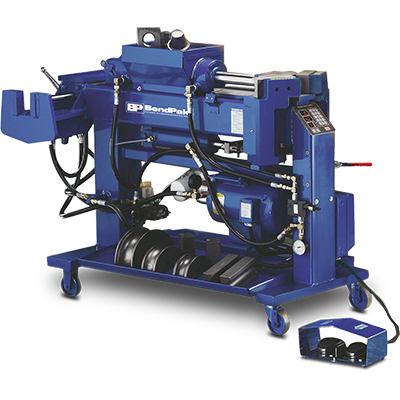 Every new pipe bender builds upon the success of its predecessor, ensuring repeated generations of pipe bending perfection. After so many decades on the job, we have a crystal clear view of what works and what doesn't. But more than anything else, the single, overriding priority with each pipe bender we create is unmatched performance and quality. BendPak assembly personnel and R&D teams test each bender as it comes off the assembly line, closely scrutinizing every detail to make sure it works as good as or better than designed. The BendPak name has long stood for the benchmark of quality. When it comes to a BendPak bender, it's like our name is on it twice. 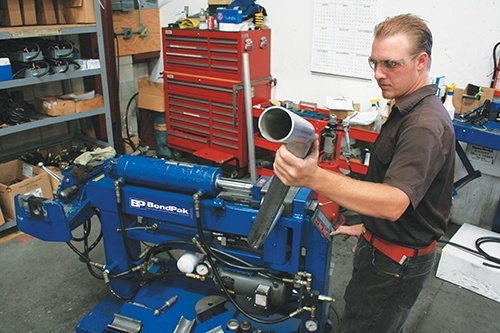 Meet the heavy-duty BendPak “Blue-Bullet” exhaust pipe bender. It takes off like a shot and helps you reach your production target every time. Includes a die package and a dual-function end-finishing unit for precision OE expansions and flares. The BendPak 1302BAS series is comprised of powerful automatic exhaust pipes benders designed to expedite the bending process. A convenient, space-saving, side-loading swager includes a die package and dual-function, end-finishing unit for extremely precise OE expansions and flares. The BendPak 1302BA series of pipe benders features an ergonomically placed and highly sophisticated keypad display that can record bending patterns for accurate and repetitive use. For extremely busy shops, an automatic pipe bender will save time and make it easy to duplicate results. 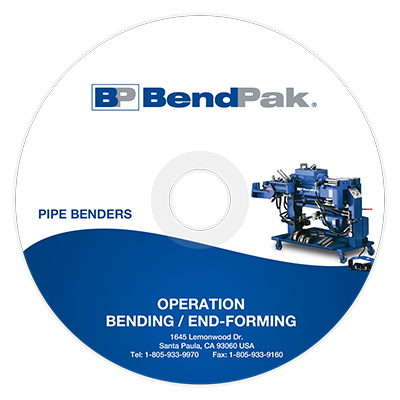 Optional 6-piece, 76 mm die package extends the bending capabilities of your BendPak pipe bender. 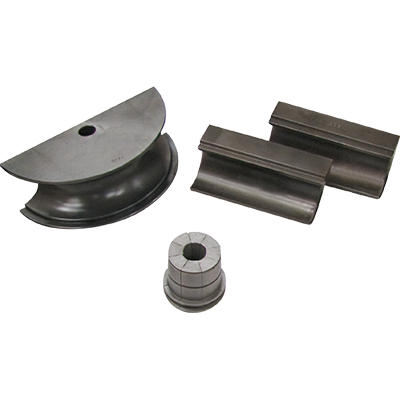 Optional 4-piece small die package extends the bending capabilities of your BendPak pipe bender. Our deluxe card system program contains over 3,500 cards on one CD, covering over 10,000 bending applications. Our benders are powerful, but at BendPak, we're in the business of empowering you. That's why we offer an entire spectrum of bender models with different architectures to suit your personal bending style. Our classic Blue Bullet series of manual benders is perfect for fabricators who love working with their hands. We also offer feature-rich, digitally controlled automatic and semi-automatic benders for those who desire extreme machine precision. Or, if you work with your back to the wall, check out the side-loading swager models. BendPak standard and deluxe die packages ensure that whatever specialty bend you're going for, you can achieve it on your BendPak Bender. We've been making benders for longer than most companies have been in business, so it's safe to call us the true bending authority. Integrated into each BendPak pipe bender are industrial-grade hydraulic cylinders that feature a single-piece, pilot-fitted, machined steel piston wrapped with specially designed, pressure-loaded U-cup piston seals, backups and wear bands that entirely eliminate fluid bypass. The micro-smooth chrome rod is machined from high-yield, ground and polished C-1045/50 micro-alloy steel and plated to a minimum of .025 mm diametrically to ensure superior cylinder operation and life. The superior, high-durometer, mechanically-loaded rod seals make rod leakage a thing of the past, while a specially formulated abrasion-resistant urethane rod wiper provides exclusion protection. The welded cylinder body is made from robust steel tubing produced to exceed ASTM specifications. This combination of superb base material and superior processing ensures that the cylinders remain straight, smooth and last a very long time. An integrated flow restrictor provides a controlled descent in the case of an unexpected hose rupture. Our exhaustive BendData program features over 10,000 bending applications. The simple computer program system guides you through every step of exhaust and tailpipe fabrication. Coverage includes domestic and light trucks as far back as 1965.